A few years after the end of The Brady Bunch, some of the castmembers reunited for an appearance on Donny & Marie, a popular variety show produced by Sid & Marty Krofft. 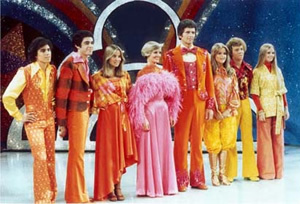 The October 8, 1976 appearance was so successful that the Kroffts decided to offer the entire Brady cast their own song and dance show, The Brady Bunch Variety Hour. What followed is one of the most bizarre television series in history. Actors Florence Henderson, Robert Reed, Barry Williams, Maureen McCormick, Christopher Knight, Susan Olsen, Mike Lookinland, and Ann B. Davis all signed on for the new show. The strange part is that they weren’t performing as themselves. The actors were playing their Brady characters. And though, the show required them to do a lot of singing and dancing, only Henderson and Williams had much serious experience doing that. The one Brady that didn’t sign on for the new series was Eve Plumb who’d played middle sister Jan on the original sitcom. At the time, Plumb was enjoying success as a serious actress and she smartly declined. She was replaced by Geri Reischl who didn’t look a lot like Plumb but could sing and dance. Does the Brady book sound like it's worth buying? Now, on the 40th anniversary of The Brady Bunch, there’s a new book that focuses completely on the little known Brady Bunch Variety Hour. Olsen co-wrote Love to Love You Bradys: The Bizarre Story of The Brady Bunch Variety Hour with Ted Nichelson and Lisa Sutton, two pop-culture writers and devotees. It’s filled with hundreds of little-seen images and reflections by members of the cast, crew, and production staff. The cast and crew struggled with the show’s shoe-string budget and a number of production challenges, not the least of which was McCormick’s indulgences with drugs. That particular aspect remained a secret for many years until McCormick published a tell-all book, Here’s the Story: Surviving Marcia Brady and Finding My True Voice . Olsen was interviewed by The Today Show’s Meredith Vieira yesterday, shared some memories, and played clips from the show. Here’s the video.